Last week, we interviewed two people contributing to the transformation of our money habits : We talked about the future of foreign exchange with Kantox’ CEO & Founder Phillipe Gelis, and the new lending solutions offered to SMEs with Lendix’ CEO & Founder Olivier Goy; both speakers at our upcoming event SPEND Paris. Today we have the pleasure to interview Pierre Lion-Bessa, VP Sales of Paris-based Mangopay, who is going to speak at SPEND Paris as well, April 28th at Le Forum des Images in Paris. RB: What is the role of Mangopay in the marketplace ecosystem? Why should marketplaces use Mangopay ? A: The marketplace ecosystem is evolving very quickly. First, it has experienced an incredible growth of 53 percent in 2015, compared to the e-commerce in general whose growth reaches 15 percent. So marketplaces need their payment system to be totally frictionless and scalable. Second, the new regulation for payment services (PSD2) states very precisely that marketplaces should not at any time enter into possession or control of client funds. This has a major impact on the ecosystem. When marketplaces choose Mangopay, they can rely on the fact that we take care of their entire payment workflow from end to end, including the pay-ins as most traditional payments methods do, but also the pay-outs, which makes it easy for them to scale up. Furthermore, as Mangopay holds an e-money issuer licence, we can hold the clients’ funds in segregated accounts on the behalf of the marketplaces. It makes them totally compliant with the new regulation. RB: What is the main advantage of being part of Crédit Mutuel Arkéa today? How do you fit their vision? A: Credit Mutuel Arkéa acquired 86% of Leetchi Group in September 2015. We have had a relationship with them for over 5 years as we worked closely together. 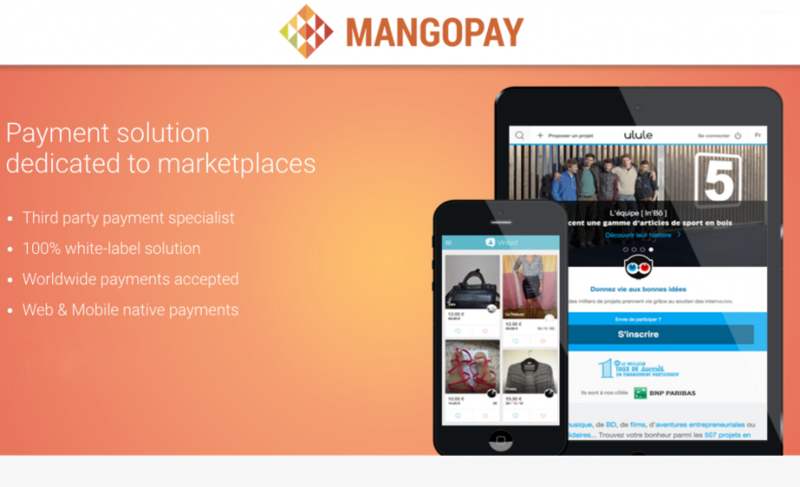 Mangopay represents an exciting opportunity for CMA to expand its market share and have a complete offering. Many important marketplaces bank with them, but previously, CMA didn’t have any end-to-end payment solution like ours to provide their clients with. Thanks to the support of a major European bank, we are able to gain greater brand awareness. People appreciate Mangopay’s technology and now it’s become even easier to choose us as we are part of a major banking institution. Three of our new clients are among the top 10 marketplaces in Europe. RB: Which type of marketplaces work best with your solution? A: We offer a fully customizable API, so we can tailor the solution for each platform according to its needs and end-customers’ demands. For instance, it can be totally transparent for the final customers that we provide an e-wallet technology, as we are white-labelled. But some platforms, like Vinted, prefer to use the e-wallet as a marketing tool. Their sellers are often buyers too, so they can use their e-wallet to get the money of their sales and use it directly to buy other products, without having to enter their card details again. Vinted has also been very innovative with its wallet marketing by topping up directly the e-wallet when the clients reach a certain amount of purchases. These marketing offers are much easier to use than a voucher you receive by email, thus developing the number of in-app transactions. RB: What is the biggest challenge scaling Mangopay ? A: Today, over 1,000 platforms use Mangopay’s API with more than 10 million people globally paying in via our system. In 2015, we processed more than 200 million euros, and in 2016, we target to double the processed volume. This high growth implies we have to improve our API all the time to make payments and access easier. For instance, we recently released a WordPress plugin so that website can integrate the solution easily. Moreover, as our clients are scaling up so fast, we are always working with them to adapt our API to their needs. RB: How do you see the future of payment ? A: The boundaries between web and mobile payments on the one side and offline payments on the other side are getting thinner and thinner. We are now working with brick and mortar networks who have online stores and marketplaces. They want frictionless payment workflows between their stores and the purchases online, that’s a challenge we totally embrace. If you want to learn more about how the way enterprises lend money is changing, join more than 500 professionals at the core of finance and technology convergence at SPEND Paris, sponsored by BNP Paribas. For this occasion, we lined up 25 speakers from San Francisco (Raphael Ouzan – VP of Product, Prosper), London (Philippe Gelis – Co-Founder & CEO, Kantox), Berlin (Christian Tiessen – Co-Founder, Savedo) and, of course, Paris (Jérôme Traisnel – Co-Founder & CEO, SlimPay). If you are interested in attending the event, you can still get your ticket below, and if you are a startup, the ticket’s price is only €39 instead of €149.